The FX-901 cordless soldering iron from HK Wentworth is an ideal tool. 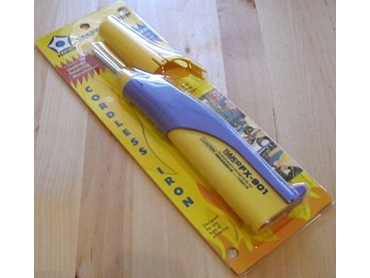 The HAKKO FX-901 is a lightweight, portable and battery-operated soldering iron. Powered by four AA alkaline or nickel-metal hydride (Ni-MH) batteries, the FX-901 will operate at a consistent temperature above 300°C for up to 120 continuous minutes. The FX-901 portable soldering iron heats up in around 1 minute, which means you do not have to wait around for extended periods of time before you can get started on the job at hand. The FX-901 portable soldering iron comes with a safety cap to protect the tip and stop the soldering iron from unintentionally being switched on. The FX-901 portable soldering iron also includes a sharp pencil tip ideal for precision soldering. The FX-901 is the ideal tool for electricians, field service technicians, maintenance personnel, hobbyists and also is for technicians that fly regularly. The FX-901 portable soldering iron can be used to solder electrical wiring, repair appliances, alarm systems, RC cars and jewellery, nearly anything that needs soldering where electricity is out of easy reach or unavailable. The FX-901 portable soldering iron is an ideal tool for every tool box. The FX-901 is available from Hakko distributors around Australia.